Book a night of entertainment with us at the Ballymaloe Grainstore and enjoy our Ballymaloe House hospitality before and after Hot House Flower's performance. Package inclusive of our early-bird 3 course pre-show supper in the Ballymaloe House dining room, followed by the show. Next day, enjoy at your leisure our award-winning breakfast buffet after a night in one of our comfortable country-house bedrooms in the heart of the East Cork countryside minutes from the coast. The world renown Hot House Flowers return to Ballymaloe Grainstore after a sold-out concert back in August 2017. The intimate, acoustic - but definitely rollicking! - concert features the trio of Liam O'Maonlai, Fiachna O'Braonain and Peter O'Toole. 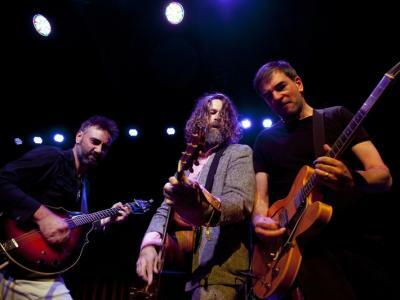 Something amazing happens when Hothouse Flowers step onto the stage – something that has been shaped by more than thirty years of singing and playing all over the world. There is a sense of musical adventure - an impulse to reach new heights and depths in music where the unspoken aim is that the band and the audience become one and the world becomes a different place for a while. Hothouse Flowers are a rock n’roll band, a traditional band, a soul band, and a jam band with their own organic jam spread on both sides of the bread! Early dinner, tickets to the show and bed & breakfast is €220 per person sharing in a standard room.